So, a day has past since the longest day – midsummer-eve – was here. It’s sad to think that the daylight hours will be less for each day that now pass, but unfortunally that’s no lie. Anyway, midsummer-eve begun with raining and a dark sky, but later there was cloudy and sunny, with some rainshowers that just had to come between it all – a rule at midsummer-eve is that it has to be a mix of rain and sunny weather, at least for the past 40 years or so. First we and family Karlsson had some traditional midsummer food at home. 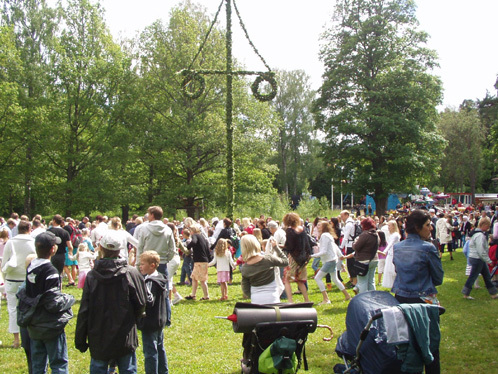 Then we all went to Brunnsparken in Örebro to see the midsummer-pole and the traditional dance around the pole. 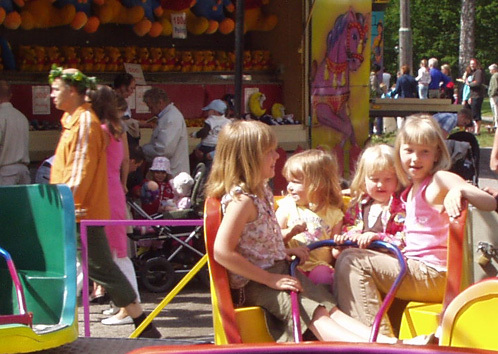 Our daughters and their cousins danced “små grodorna” (tiny frogs) a typical midsummer dance, and later they went for some rides at the different carnival rides. Later we had some barbecue at home, including some great wine, beer and other drinks. The day after, saturday, was a resting day, nothing much happened and not a single drop of rain – off course! Blev inte så mycket traditionellt midsommarfirande här hos mig.. ingen dans eller så. Men haft en kanonhelg ändå i det fina vädret.